At Hampton Rustic Landscapes we pride ourselves in our ability to move large mature specimen trees. We have spent the last 15 years perfecting our technique for digging the tree, hand shaping the root ball, wrapping the exposed root base with twine (or “skinning” as it is known in the industry), and the actual moving of the tree to its new home. We take into account many details like; the time of year, age and height of the tree, type of tree, soil composition, fertilization, root pruning , and branch stabilization just to name a few! Clients approach us to transplant mature specimen trees for a number of reasons but the most common is that the tree has outgrown its original planted position and it occupies valuable land that is needed for house expansion or new construction. Our clients also see the value in saving a mature specimen tree for its beauty, mature shade canopy, health of the eco-system, and most importantly the inability to go out and purchase something of equal size and age. That’s where Hampton Rustic Landscapes expertise comes in very handy. We are without a doubt known in the industry as the go-to company to call for difficult and technical tree moves. Most recently The Brooklyn Botanic Gardens of NYC called to have Hampton Rustic Landscapes move ten of their most prized specimen trees from the Native Floral Garden to the Japanese Zen Garden. 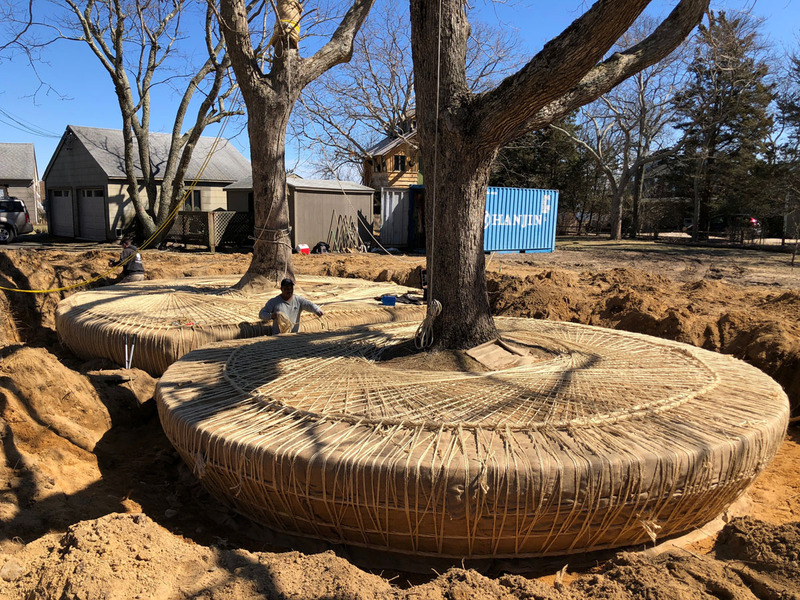 We are currently working on moving 3 specimen White Oaks on Shelter Island- each weighing over 250,000 pounds- the equivalent of 19 full grown African male elephants each tree! Its unique challenges like these tree moving opportunities that the Hampton Rustic Landscape team thrive on and excel at.